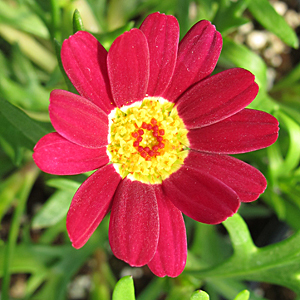 (Marguerite Daisy) Simply Beautiful Madeira™ Red Argyranthemum has an upright habit that produces mounds of red daisy blooms. Plant in combination with Yellow and Purples for a stunning combination look. Madeira™ Red is an excellent choice for the landscape or in combination planters and window boxes. Argyranthemum blooms are sure to attract butterflies to your gardens.